It’s the middle of peak canning season and I have NO time to do it 🙁 On top of all of the things that normally keep you busy during the summer in Michigan (fun things like vacations up North, boating, etc) my family has been crazy doing other stuff. I got my real estate license, my son has had to start patching his eye for 6 hours a day (long story and I’m not going to go into it), my Etsy business has been doing pretty well (Wedding season, you know?) AND my husband and I started a business. I haven’t really had too much time to focus on my blog, which is a bummer. It seems like it’s not a big deal because really, it’s not as important as a lot of the other stuff, BUT – when I take a peak at the blog posts I did last year and 2 years ago I get flooded with memories. It doesn’t seem like I write a lot about my personal life in these posts but the little bits that do get posted are a great reminder of times passed. Soooooo since I’ve realized that this blog gives me a little glimpse into the past, I’m going to try and start blogging again. At least 1x per week….AND I’m going to try and include one little tidbit of my personal life that I want to remember. 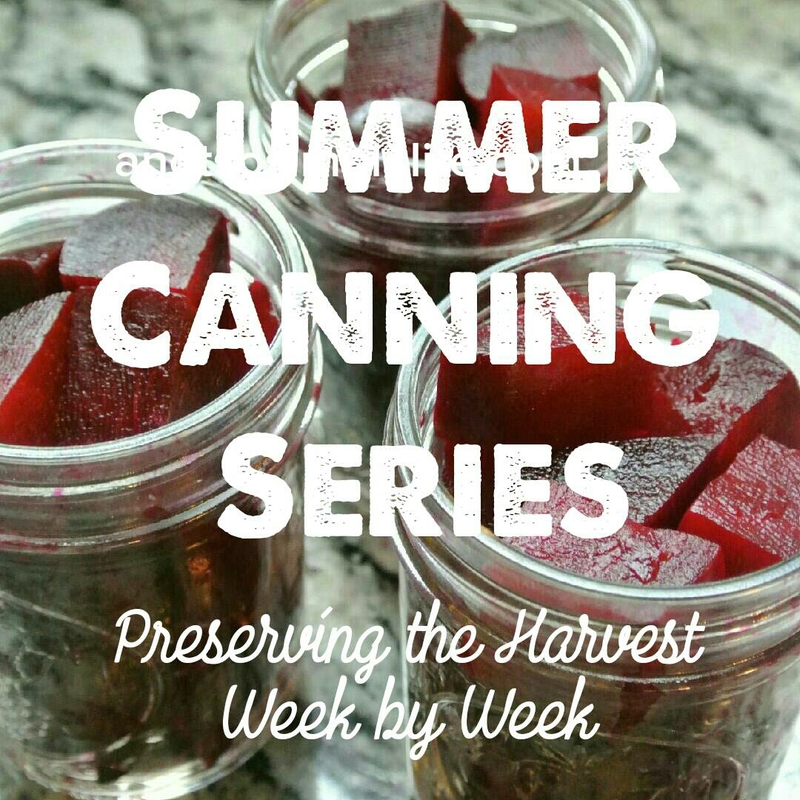 Because it’s the middle of canning season, my garden’s doing really well, and I’ve found a fabulous farmer’s market I’ve decided to do my weekly posts on my canning. So far this year I’ve managed to find the time to make black raspberry jam, 2 batches of Michigan picked Dilly Beans with fresh dill! My first batch of “Best Ever Refrigerator Dill Pickles”, a batch of “Sweet and Zesty Refrigerator Pickles”, a batch of “Best Ever Refrigerator Sweet Dill Pickles”, and a batch of Dill Spears with Fresh Dill Heads. On the to do list…..Well, lots! We picked and froze Michigan strawberries, blueberries, and tart cherries because I just didn’t have time to make the jam right then. I’m also determined to find my favorite canned salsa recipe (which I lost last year :(), make some peach chutney and rosemary spiced peaches, make some salsa verde (if I can find some tomatillos that are good enough – I should have grown them! They did fabulous in my garden the last time I did! ), make my absolutely favorite (and everyone else’s favorite) corn relish, pepper and onion relish, and maybe if there’s time, make a few types homemade spaghetti sauce, because my toddler loves “nood” (noodles). Before you get started make sure you have all of your canning supplies and brush up on your canning basics. The products I recommend are available via the following affiliate links. When you click through the link and make a purchase, I make a small commission to help fund my blog (it doesn’t have to be what I’m recommending and you’ll never get charged more AND I really appreciate it!). My full disclosure is here. For all canning, you’ll need to know the basics such as properly sanitizing your tools and jars and water bath canning. I would recommend reading this post from Ball on canning basics. You will also need something like I have, like this – Granite Ware Canning Kit, 9-Piece that includes the enamel pot and rack, a funnel, a jar grabber, a head space measuring tool, etc. You will also need Ball Canning Half Pint (8 oz.) Jars with lids and bands for all of the jams and jellies, and larger jars, either pints of quarts for things that are pickled. 2nd week of July: First pickling cucumbers are ready to be picked! First beets to be harvested! 3rd week of July: Black raspberries are in season! 1st week of August: Green beans are if full swing! Dill heads are perfect for pickling! 3rd week of August: Tomatoes have been in season for awhile but for some reason mine just started producing! 4th week of August: Corn has been producing for quite some time but the peppers have only been so-so. The peppers were wonderful last week so it’s time to make corn relish! 1st week of September: Peppers!